The portable P2 Bluetooth speaker provides quality audio when and where you want. This splash and dust-resistant speaker fits in the palm of your hand and slips into a pocket for easy transport. This wireless speaker personalizes audio with smart features like snooze and voice activation, accessible with a shake or a tap. The Beoplay App even lets you match sound profiles to activities. 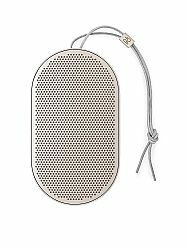 A mini speaker with big sound, P2 delivers Bang & Olufsen Signature Sound for a clear audio experience. This speaker is equipped with a built-in microphone for clear calling and voice activation. The P2 looks and feels as good as it sounds. A smooth, pearl-blasted, anodized aluminum grill over a polymer frame offers durability, while a leather strap makes it easy to bring your music along. Keep the music going with the powerful battery in this wireless speaker. The P2 offers up to 10 hours of playtime per charge, and an included USB-C cable ensures that you’ll always have back up.